Vietnam is the easternmost country on the Indochina Peninsula in Southeast Asia. For much of its history, Vietnam was a predominantly agricultural civilization based on wet rice cultivation. There is also an industry for bauxite mining in Vietnam, an important material for the production of aluminum. The Vietnamese economy is shaped primarily by the Vietnamese Communist Party in Five Year Plans made through the plenary sessions of the Central Committee and national congresses. For further information on the types of business entities in this country and their abbreviations, see "Business entities in Vietnam". This list shows firms in the 2017 Forbes Global 2000, which ranks firms based on four measures: sales, profit, assets and market value. The list only includes publicly traded firms. 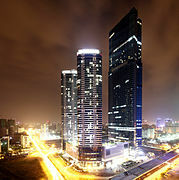 Keangnam Hanoi Landmark Tower in the Từ Liêm District. State Bank of Vietnam in Ho Chi Minh City. Saigon Port in Ho Chi Minh City. ^ "Vietnam". United States Energy Information Administration. 2011. Retrieved 6 November 2012. ^ "The World's Biggest Public Companies List". Forbes.com. 2017-05-24. Retrieved 2017-12-16. ^ Murphy, Andrea (2017-05-24). "2017 Global 2000 Methodology: How We Crunch the Numbers". Forbes.com. Retrieved 2017-12-16. ^ "Pjico - the brand of a vision - Petrolimex : Vietnam National Petroleum Group". Petrolimex. Retrieved 2017-12-16. ^ "Savimex Corporation: Private Company Information". Bloomberg. Retrieved 2017-12-16. ^ "Southern Seed on the Forbes Asia's 200 Best Under A Billion List". Forbes.com. Retrieved 2017-12-16. ^ "Viglacera Corporation: Private Company Information". Bloomberg. Retrieved 2017-12-16. ^ "Vietnam National Textile and Garment Group: Private Company Information". Bloomberg. 2017-01-03. Retrieved 2017-12-16. This page was last edited on 20 February 2019, at 02:21 (UTC).